Mary A. Underwood, 72, passed away on October 21, 2018. 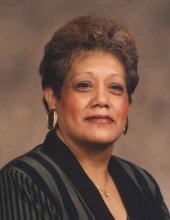 She was born on April 9, 1946 to Margarito and Petra (Diaz) Bais in Carrizo Springs, Texas. Mary was an amazing mother and grandmother. She loved to cook and travel, and she was employed with various care facilities in the Toledo area through the years. In addition to her parents, Mary was preceded in death by her husband, Franklin D. R. Underwood; brothers, Tibersio “Tony,” Joseph, Jesse, and Armando Bais. She is survived by her children, Donna Ramsey, Edward Medina, and Jose “Joey” (Jacque) Medina; step-daughter, Karen Underwood; grandchildren, Randi L. Morgan, Jacob (Nikki) Edie, Ciara Medina, Ace Medina, Cruz Medina, Justice Medina, Stone Medina, Loreal Schafer, and Joshua Loy; 11 great-grandchildren; siblings, Chenita (Art) Banda, Mike Bais, Margarito Bais Jr., Alfredo “Freddie” Bais, and Andy Bais; sisters-in-law, Agnes Aguirri and Betty Bais. Services will be private. Special thank you to Ebeid and ProMedica Hospices for their care and kindness. To plant a tree in memory of Mary A. Underwood, please visit our Tribute Store. "Email Address" would like to share the life celebration of Mary A. Underwood. Click on the "link" to go to share a favorite memory or leave a condolence message for the family.